With the Nurgle caravan rolling into town some might have feared that my butterfly mind has flitted away from Tzeentch but worry no longer – the Changer still has me firmly in his grasp. However I have been taking some time out to think about my biggest problem with my Tzeentchian cultists, the fact that they are all difference sizes. Now really that shouldn’t be an issue, after all the god of mutation is probably the most likely of all the Chaos powers to have followers short and tall, thin and wasted scholars marching alongside bloated horrors tumbling into spawndom. However when I put the models all together it never looked right, they were a jumble without anything to give them cohesion or create the appearance of a unified force. Bases were also an issue, the big models hung off the sides of 25mm bases, the smaller ones were lost in the middle of 32mm bases and when I tried a mix of base sizes in the squad it only served to highlight the disparity in sizes. Time for a re-think. The weakest, and often the least experienced, of the Great Architect’s many followers, the Least are desperate to prove their value and rise in their master’s gaze. Already some have begun to manifest changes and ambition seethes around them for truly each is bound for unrivalled power and glory. A raw recruit, risen from a worker gang, determined that a better life can be his if he has sufficient will. 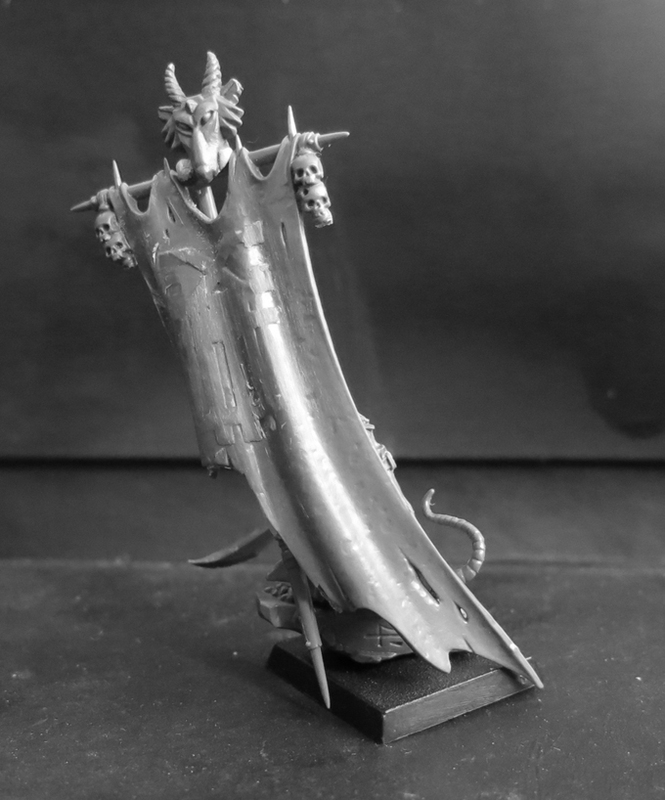 This one may possess a bestial form but he is still a long way from achieving true ascension into the ranks of the Tzaangors. 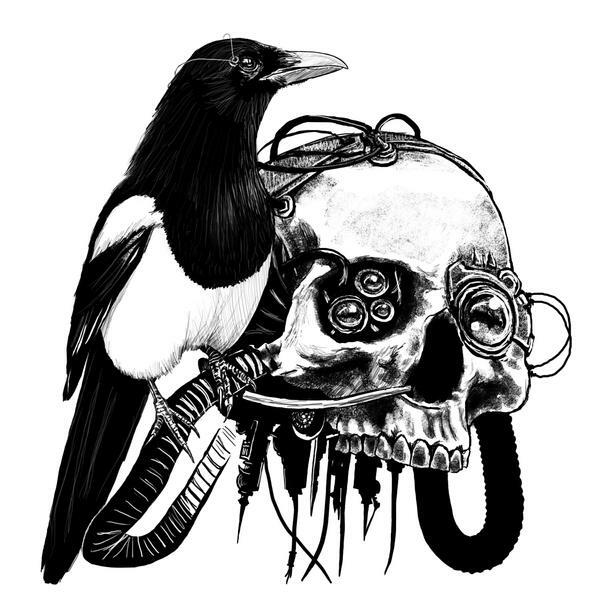 This one is watchful… ever watchful… What schemes and visions boil and churn within his birdlike skull? Whilst countless of their brothers have fallen along the way the Ascendant care not. The glory for which they strive is almost within their grasp and even as those around them are pulled down into darkness and spawndom they force onwards, towards the light and the spiralling laugher that echoes from it. This one has grown in stature but his head remains a tiny, half-moon. Tzeentch does not need wits to challenge his own amongst his followers, sometimes raw strength is enough to achieve what must be done. This one is just a straight up, unconverted Silver Tower acolyte. I just happen to really like the look of him. 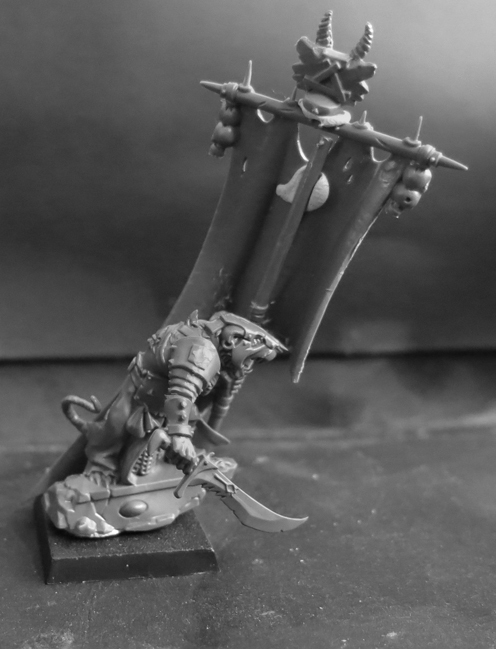 This one is well on his way to becoming a Tzaangor. However the Changer clearly has a much stranger fate in mind for this one. And this one is no less twisted! Only the strongest and luckiest survive Tzeentch’s labyrinth of trials to join at last in the braying flocks of the Great Conspirator’s chosen. They have seen many things along the road however, exposed to the raw energy of the Warp and the capering flocks of daemon’s therein. They know now that to become a Tzaangor is not the end of the road, merely a stepping stone from which the ambitious can rise toward a greater destiny. Princedom calls and the Changer’s twisting web pulls ever tighter. I’ve only made one Tzaangor so far, converted from one of the Silver Tower models. More will come eventually. A comparison shot to demonstrate the differences in size that have been troubling me. 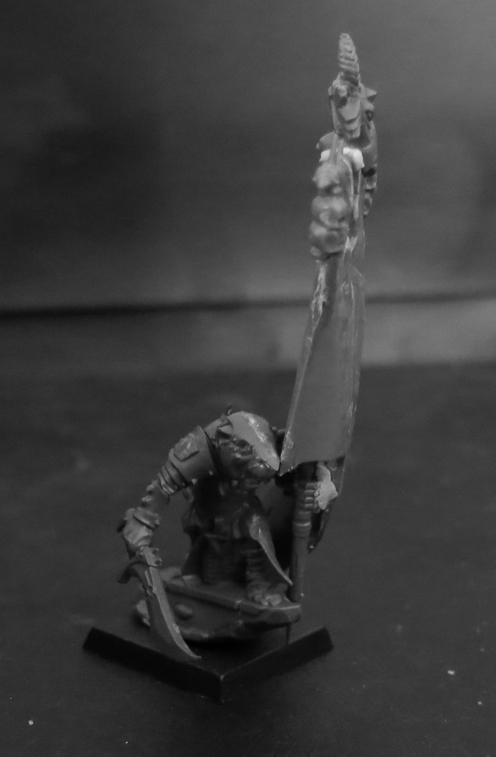 Next steps will be to bolster the ranks with more cultists of various stripes, plus coming up with some characters to lead the flock in enacting its labyrinthine schemes. 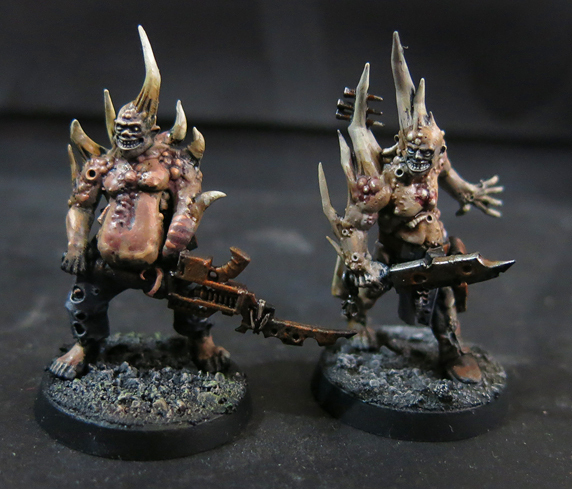 My first two filthy poxwalkers are finished. As soon as I saw the Noxious Blightbringer I knew I wanted one for my collection. Picture the scene if you will; the Death Guard advancing shrouded beneath clouds of toxic vapour, deamonic beasts wheeling half-seen in the clouds overhead. Thousands of shambling corpses lead the way, their low moans audible over the dense, buzzing static – no, not static but the wings of a million newly hatched flies. 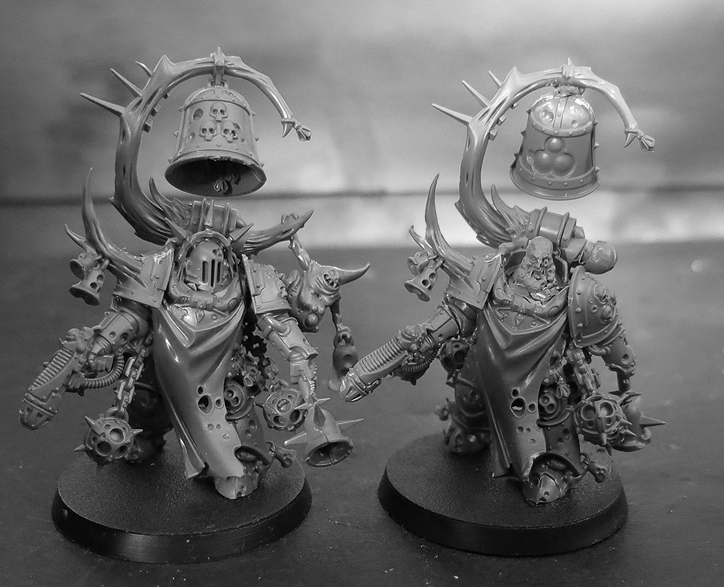 Louder still are the bells of Nurgle’s most devoted priests, their deep-voiced booming calling the Plague-God’s gaze so that his children might truly exult in his fetid blessings. Never mind I still wanted at least one. Indeed the more I thought about it the more I wanted a second, the visual impact of two being more than twice that of one after all. The question was, how easy would the model be to convert? As it turns out, not that hard at all. I was keen, as much as possible, to stick with components from the original model. After all this is a starter set figure and although many of those are picked up by old hands looking to expand a collection plenty more go to complete newcomers. With that in mind I wanted to explore how easy it would be to convert the model for someone with a fairly limited bits box to call upon. In the end I used two components from other kits; the head – from one of the Maggoth Lords and the backpack vent from a damaged Space Wolf backpack. Here’s the original model by way of comparison. And here’s the two side by side (as usual don’t give yourself eye-strain, click on the picture to make it bigger). I may make a few more tweaks but overall this was a spectacularly straightforward conversion. Now it’s off to the painting desk for both of them. What with one thing and another it’d be easy to believe I’ve forgotten about the Chapel and my intrepid band of Inquisitorial agents but I can assure you the truth is quite the opposite. I may not have blogged about them quite as often as I should have but do not doubt for an instant that they were always on my mind. At last however, after considerably tinkering and tweaking, I finally have something to show for my efforts. 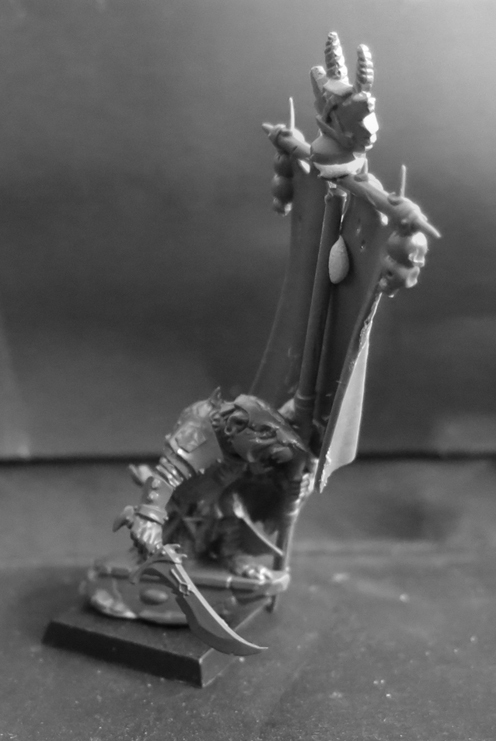 Pending any major issues raised – and as ever if you see something that needs fixing you know where the comments box is – Inquisitor Morix of the Ordo Mors is ready for paint. Let all who would disturb the rest of the glorious Imperial dead tremble! The base itself also deserves a close up, it’s part of a set sent to me by Black Earth as a preview of their forthcoming range so thanks once again to Mark, both for this and for all his efforts to make the Chapel a reality. One of the things I was keen to convey with this model was the sheer bulk of a (relatively) unaugmented human in power armour. My own feeling, and there may be background somewhere that contradicts this, is that Astartes power armour will only ever work for a wearer with space marine physiology. A normal human, even one with substantial internal tweaking like Kor Phaeron or my own inquisitor, just couldn’t wear it – regardless of the fact that they’d be too small for it anyway. To put an ordinary human in power armour requires lots of adjustments, to both the person and the suit, before either is ready. Furthermore whilst space marines and their armour are both made in what is essentially a production line fashion and can therefore pick their power armour off the shelf each inquisitor will be different, with different needs and different levels of internal augmentation and implants, and as a result will require a custom suit. Not only that but whilst each space marine chapter has its own personal forges, armouries and thousands of specialist thralls dedicated to maintaining their armour an Inquisitor, particularly one who spends the majority of his time in the field as Morix does, needs something that can be repaired on the fly by pretty much anyone who knows which end of a spanner to hold (and has a basic grasp of the prayers needed to calm the armours fractious machine spirit). My intention was for his suit to appear industrial, as though it’s been built from some kind of void-armour or forge-suit of the sort that Terminator armour was based upon. The fact that it should also be downright intimidating for any heretics he comes across is a lucky bonus. With this in mind I built a suit that relies more on its size and weight to provide both its protective and aggressive capabilities. This man may not move fast but small arms fire will ricochet from him like a hab-block wall and when he hits you you’ll know all about it. By way of demonstrating Morix’s size and bulk here he is standing next to a battle brother of the Adeptus Astartes (recently emerged from the Dark Imperium box of course). 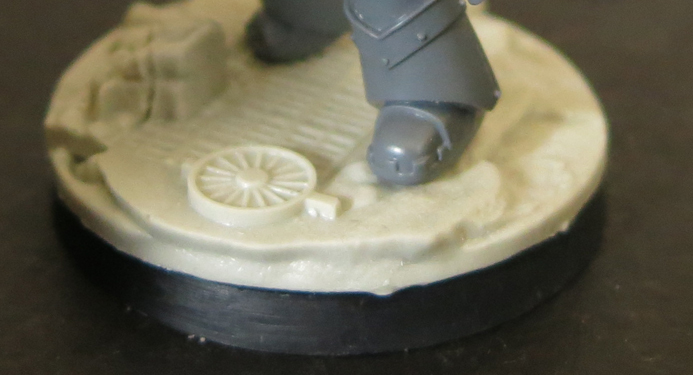 And here he is towering over my lone Imperial Guardsman who remains my go-to guy for demonstrating size comparisons next to a normal human. Fans of the skelliebird that usually perches on his arm fear not, he’s flown off somewhere but he’ll be returning shortly. In the meantime I also put together a drone to assist Morix in his investigations, floating ahead in order to carry out any scouting or espionage he may require. After all if you’re as big and heavy as Inquisitor Morix you aren’t going to be sneaking up on anyone by yourself. I did try to give the drone arms so it could lift and carry objects it finds, rather than just providing surveillance, but as yet I’ve not managed to find a way to do that which doesn’t unbalance it. In the meantime here it is hovering next to its master.